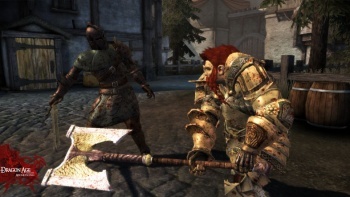 Dragon Age: Origins Online Producer Fernando Melo says BioWare was surprised by the mainstream success of the hit fantasy RPG and suggested that the studio might someday consider translating the game into the MMOG genre. Released in November 2009, Dragon Age: Origins has received widespread critical acclaim, including sky-high review scores, numerous Game of the Year and RPG of the Year awards and perhaps most important of all, more than 3.2 million copies sold as of February 8, not a bad total for a game that billed itself as an old-school, party-based fantasy RPG. "I think we've been really pleasantly surprised, obviously," Melo said in an interview with IncGamers. "I think we always believed in the game, we always wanted to make this kind of game, but having that kind of validation where it's not just the PC press or gaming press in particular, but mainstream press! We hear about Dragon Age now in TV, news, newspapers, and other media where I never would have expected to see Dragon Age, typically." As a game created to follow in the footsteps of the decade-old RPG classic Baldur's Gate, Dragon Age: Origins could count on a small but dedicated following of old-timer RPG fans, but Melo noted that the game's audience has grown far beyond that. "We start to see people that are blogging on business sites and they mention Dragon Age, and relationships, and all these other things that I keep seeing cropping up, and it's crazy! It's fantastic," he said. As for the future, BioWare plans DLC, expansions, sequels and, Melo suggested, maybe some thought about a move into the MMOG space. There's "enough material there and there's enough richness to the world that we could do it," he said. "Whether we want to or whether it's something that we would consider doing, time will tell." Dragon Age: Awakening, the first expansion to Dragon Age: Origins, is set for release on March 16 in North America and March 18 in Europe.